Montgomery's brand new Holiday Inn Express Hotel invites you to enjoy the ultimate hotel experience. 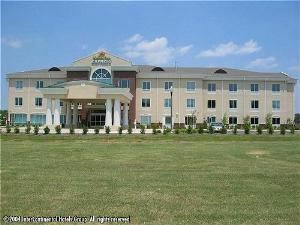 We are conveniently located: 10 minutes from downtown, 3 miles from Shakespeare Festival, 15 minutes from Hyundai Plant & Airport, 6 miles from Gunter Base & Garrett Coliseum, 2 miles from Alfa Insurance & Baptist Hospital, and 1 miles from Montgomery Mall. This impressive facility offers 59 spacious guest rooms including specialty suites with amenities such as mini fridges, microwaves, coffee makers and sofa beds. Handicap accessible suites available with a roll-in-shower, non-smoking or smoking.Hotel guests enjoy a delicious complimentary breakfast bar beginning at 6:00 AM until 9:00 AM (Featuring fresh, hot cinnamon rolls, assorted breads, fresh fruit, whole grain cereals, pastries, muffins, milk, juices and much more!!!!) Complimentary coffee and tea 24 hours a day.All of our rooms have spacious work areas, 2-line speaker phones with data ports, voicemail, and free high speed Internet access. Maintain your fitness routine in our on-site fitness facility and soak away your troubles in a jacuzzi tub suite. We also have a conference room with 65 seats, and a board room with 12 seats. 'Stay Smart with us.“Swimming pool is closed for the season.